Gateway Safety has redesigned its Serpent® safety helmet. With a fresh, sleek shell design, the popular helmet line now includes an unvented Class E model, and Serpent is now available in several new colors. Many of the original features that have helped make compliance less of a battle for employers have been maintained: a rotating ratchet adjustment system (pin-lock also available); an eight-point, six-strap suspension for extreme comfort and impact resistance; and a soft, cloth brow pad. And it’s still lightweight—just 13 ounces—to ensure day-long wearability. Plus, the suspension system comes partially pre-installed, lowering the risk of ill-fitting helmets and potential injuries on the job. 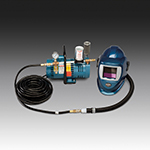 The Deluxe Supplied Air Shield and Welding Helmet (Blue) from Allegro is a performance proven and cost effective system used by foundries, aluminum plants, mines, chemical plants, refineries and more. The wielding shield flips up, allowing the user to grind and clean metal looking through a clear ANSI face shield. In addition, the wielding shield is designed with a variable shade and auto-darkening lens. The solution provides all-in-one protection from hexavalent chromium, flying debris, sparks, cutting and chemical or metal splashes. The solution can fit a one worker or two worker need. The new Serpent® Safety Helmet from Gateway Safety provides durable impact protection and exceptional electrical insulation for a wide range of environments. The helmet meets the ANSI Z89.1 standard for Type 1 helmets, Class E, G & C and has a sleek, modern shell design. A rotating ratchet adjustment system makes sizing easy, and an eight-point, six-strap suspension provides extra comfort. All Bradley Corporation swing-activated eye and eye/face wash solutions now include the innovative HALO™ eye and eye/face wash sprayhead. It offers a superior wash pattern for the most effective contaminant relief available. The HALO eye/face sprayhead covers 85 percent of the user’s face, which provides 20 percent better protection than other eye/face washes. Honeywell Safety Products' Uvex Turboshield faceshield headgear delivers superior comfort through a patented cradle that provides 300% more contact area than traditional suspensions and eliminates pressure points for all-day wear. 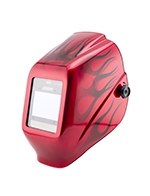 A patent-pending, push-button release system enables extremely easy visor exchange in seconds. The unique, toric-shaped visor provides excellent optics, increased field of view, and 50% more chin coverage than traditional cylindrical visors without the need for bulky accessories. Honeywell Safety Products introduced the new HW100 and HW200 auto-darkening-filter welding helmets with shade 9-13 protection. The helmets’ innovative design combines the safety and performance of high-quality ADF filters with a sleek, lightweight helmet shell for superior comfort and increased productivity. 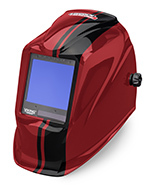 With a light state of Shade 3 on the HW100 or Shade 4 on the HW200, these welding helmets offer a clear view of the work area during set-up, as well as pre- and post-fabrication activities. The 370 Welding Helmet Headgear from Jackson Safety features a three-position slider that adjusts the distance of the lens from the user's eyes. Its removable comfort cradle head pad pivots to provide the highest degree of comfort, and a sweatband absorbs perspiration, preventing it from interfering with vision.